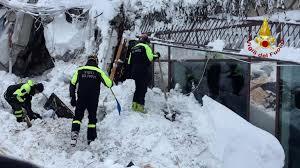 Rescuers in central Italy have found 10 survivors after an avalanche buried a mountain hotel. Three were pulled from the snow overnight, bringing the total number rescued to eight. Workers say they will continue efforts to free the other two, and to find about 20 people still missing. 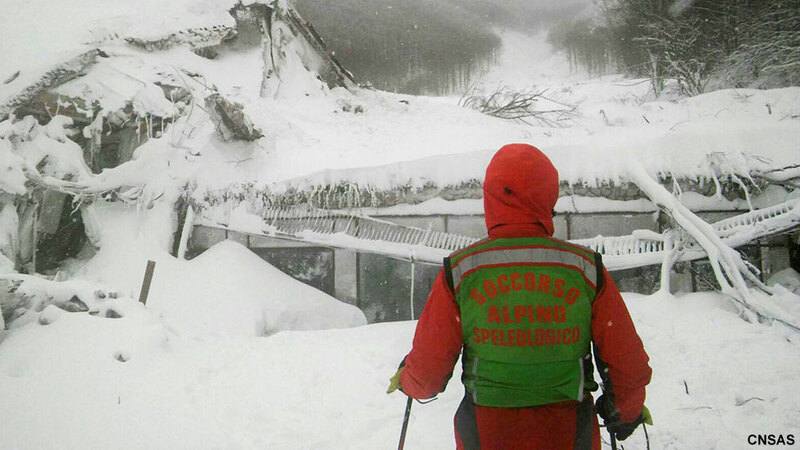 At least four people died when an avalanche triggered by an earthquake smothered the Rigopiano hotel, in the Abruzzo region, on Wednesday. On Friday, five of the survivors – four children and a woman – were pulled from the ruined hotel. There were cheers as the survivors emerged from a hole in the snow. They had reportedly taken refuge beneath a collapsed portion of ceiling, where they were able to light a fire to keep warm for two days. The rescue has been hampered by deep snow blocking an access road. 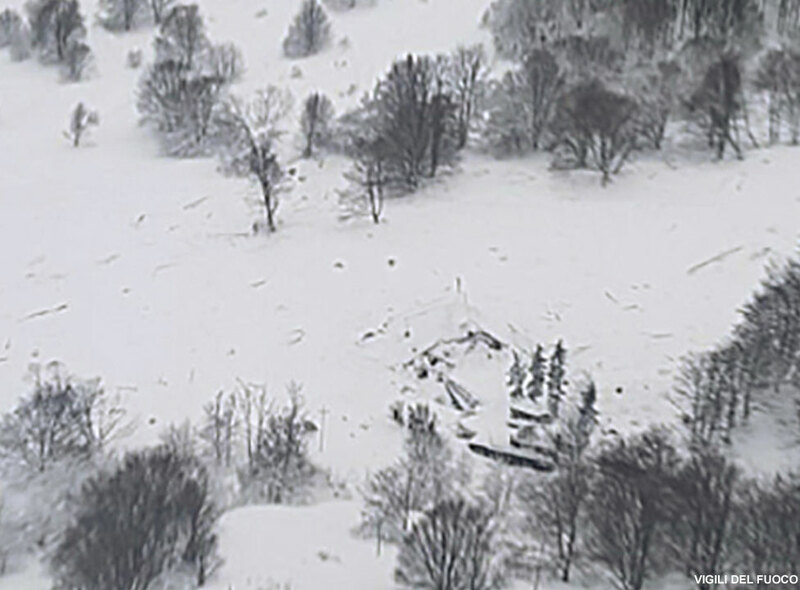 There are also concerns that further avalanches could follow, Italian newspaper La Stampa reported. 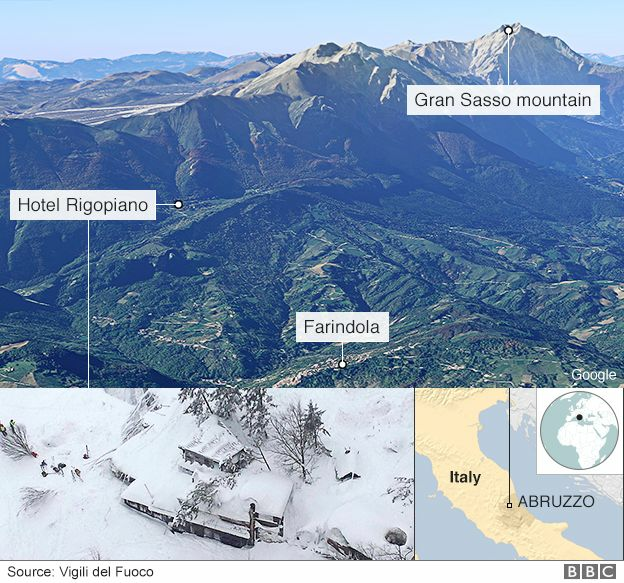 The first person pulled out was an eight-year-old boy, the son of a holidaymaker, Giampiero Parete, who had gone to his car when the avalanche struck and first sounded the alarm by calling his boss. The boy’s mother, Adriana, was pulled out next, telling rescue workers her six-year-old daughter was still trapped inside. The little girl was also later saved and the family was reunited at a hospital in the coastal town of Pescara. Hospital officials told the Associated Press news agency they had symptoms of hypothermia and dehydration, but were otherwise in good health. Friends and relatives of the missing have been gathering at the hospital to wait for news. The BBC’s James Reynolds, in the nearby town of Penne, said news of the rescue had led to an outpouring of emotion. In one village, a young woman, who’s worked at the collapsed hotel, dropped to her knees and burst into tears when she heard the news, he said. Wednesday’s earthquakes included four stronger than magnitude 5, in a region already struggling with heavy snowfall that buried phone lines and took out power cables. Many of the guests had gathered on the ground floor of the hotel to await evacuation following the earthquakes. 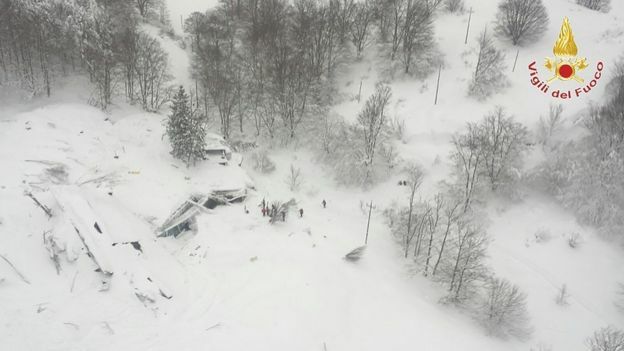 But the avalanche completely buried the hotel at about 17:00 (16:00 GMT) on Wednesday. The force of the snow partially brought down the roof and, according to some reports, shifted the building 10m (11 yards) off its foundations. 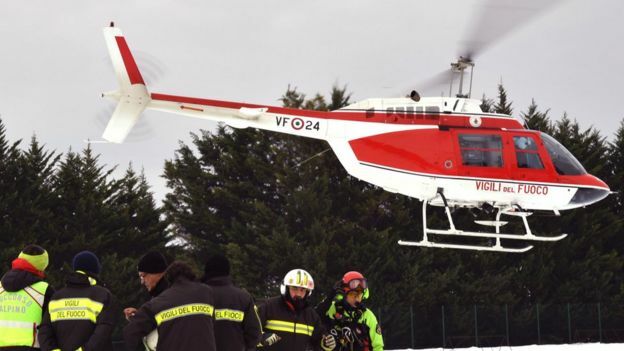 Rescuers, who were forced to ski and shovel their way towards the site of the avalanche, were reportedly only dispatched hours later. Mr Parete, who escaped the deluge when he went to his car to pick up headache tablets for his wife, telephoned his boss, a man named Quintino Marcella, just after 17:30. Mr Marcella said he immediately contacted the authorities, but they did not initially believe him. He said he kept calling for two hours before being told help was on the way. 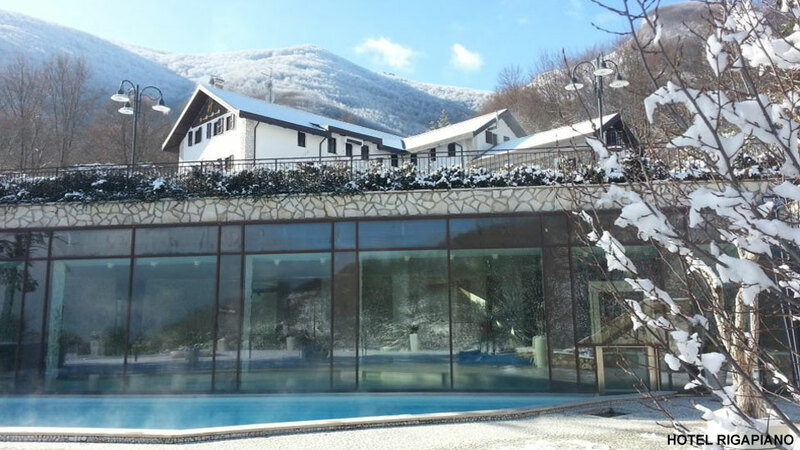 The first rescue team reached the hotel by 04:30 on Thursday, after a night of freezing temperatures. 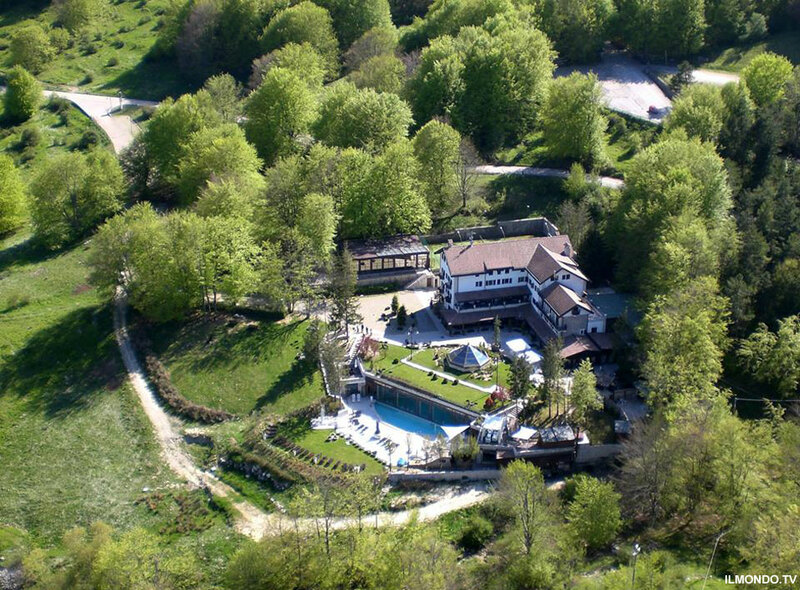 Rescuers are unsure of the exact total of people – guests and staff – who were at the hotel, but say it could be as many as 35. Italy has seen a wave of damaging earthquakes in recent months. The Apennines region saw three magnitude-6 tremors between August and October. It is believed that the geological stress is spread across a number of fault lines in Italy’s mountain ranges – with recent earthquakes as the result. Previous articleThe Gambia’s long-term leader Yahya Jammeh says he will step down, after refusing to accept defeat in elections.